Are There Bogymen in Your Basement? To Buy, or Not to Buy... A Blistered Boat That is. Why do so many small boats founder in the ocean? We take a look at this problem and provide some answers on how to avoid becoming a statistic. 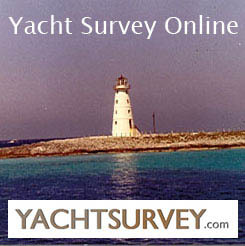 And Why New Boat Surveys are Becoming a Necessity. Whether you're a stinkpotter or rag boater, this arcane and disinteresting subject is of major importance to your wallet. Taking the quick and easy way out by just ramming in a few screws through a cored structure can and does cause thousands of dollars of unexpected damage. ..., your insurance policy obligates you to take all reasonable actions to preserve it from further loss and damage. This article deals primarily with sailboat leak problems. However, the principles and methods discussed here apply equally well to power boats. Is Your Boat a Leaky Tiki? If so, it's probably going to cost you big bucks if you don't get those leaks fixed fast. How to Prevent $15,000 Worth of Damage for $5 and 30 Minutes of Your Time. Do They Produce Reliable Results? There are Great Values in Used Boats, But the Cost is More Than Just the Price. Liability Risks for Failure to Report Inadequate Repairs Runs High. Many Water Saturated Hulls Don't Blister .